For introductory courses (sophomore/junior) in Digital Signal Processing and Signals and Systems. Text may be used before the student has taken a course in circuits. Please contact your local Pearson Sales Representative for further information. This text is derived from DSP First: A Multimedia Approach, published in 1997, which filled an emerging need for a new entry-level course not centered on analog circuits in the ECE curriculum. It was also successfully used in 80 universities as a core text for linear systems and beginning signal processing courses. 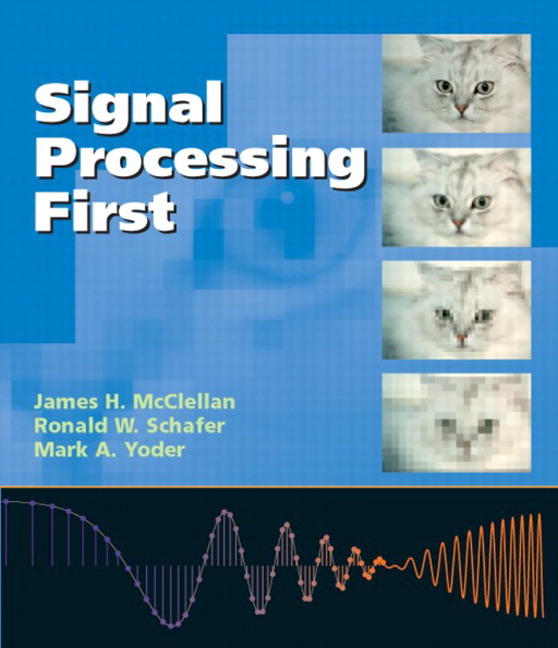 This derivative product, Signal Processing First [SPF] contains similar content and presentation style, but focuses on analog signal processing. Note: DSP First: A Multimedia Approach remains in print for those who choose a digital emphasis for their introductory course. Four new chapters on analog signal processing systems, plus many updates and enhancements. Creative use of innovative, computer technology—Makes abstract content more accessible, enabling it to reach a wider range of students. Unique features from this work, such as visual learning animations, hands-on demonstrations, and integrated laboratories in multimedia format are widely hailed as essential learning tools for mastering fundamental concepts. Many actual signals and sound files can be viewed with a Web browser or imported into MATLAB. Archive of hundreds of solved exercises on CD, plus much more. Mathematical Representation of Signals. Mathematical Representation of Systems. Thinking about Systems. Tuning Fork Experiment. Review of Sine and Cosine Functions. Sinusoidal Signals. Sampling and Plotting Sinusoids. Complex Exponentials and Phasors. Phasor Addition. Physics of the Tuning Fork. Time Signals: More Than Formulas. The Spectrum of a Sum of Sinusoids. Beat Notes. Periodic Waveforms. More Periodic Signals. Fourier Series Analysis and Synthesis. Time-Frequency Spectrum. Frequency Modulation: Chirp Signals. Sampling. Spectrum View of Sampling and Reconstruction. Strobe Demonstration. Discrete-to-Continuous Conversion. The Sampling Theorem. Discrete-Time Systems. The Running Average Filter. The General FIR Filter. Implementation of FIR Filters. Linear Time-Invariant (LTI) Systems. Convolution and LTI Systems. Cascaded LTI Systems. Example of FIR Filtering. 6. Frequency Response of FIR Filters. Sinusoidal Response of FIR Systems. Superposition and the Frequency Response. Steady State and Transient Response. Properties of the Frequency Response. Graphical Representation of the Frequency Response. Cascaded LTI Systems. Running-Average Filtering. Filtering Sampled Continuous-Time Signals. Definition of the z-Transform. The z-Transform and Linear Systems. Properties of the z-Transform. The z-Transform as an Operator. Convolution and the z-Transform. Relationship between the z -Domain and the <F128>w-Domain. Useful Filters. Practical Bandpass Filter Design. Properties of Linear Phase Filters. The General IIR Difference Equation. Time-Domain Response. System Function of an IIR Filter. Poles and Zeros. Frequency Response of an IIR Filter. Three Domains. The Inverse z-Transform and Some Applications. Steady-State Response and Stability. Second-Order Filters. Frequency Response of Second-Order IIR Filter. Example of an IIR Lowpass Filter. 9. Continuous-Time Signals and LTI Systems. Continuous-Time Signals. The Unit Impulse. Continuous-Time Systems. Linear Time-Invariant Systems. Impulse Responses of Basic LTI Systems. Convolution of Impulses. Evaluating Convolution Integrals. Properties of LTI Systems. Using Convolution to Remove Multipath Distortion. The Frequency Response Function for LTI Systems. Response to Real Sinusoidal Signals. Ideal Filters. Application of Ideal Filters. Time-Domain or Frequency-Domain? Definition of the Fourier Transform. The Fourier Transform and the Spectrum. Existence and Convergence of the Fourier Transform. Examples of Fourier Transform Pairs. Properties of Fourier Transform Pairs. The Convolution Property. Basic LTI Systems. The Multiplication Property. Table of Fourier Transform Properties and Pairs. Using the Fourier Transform for Multipath Analysis. 12. Filtering, Modulation, and Sampling. Linear Time-Invariant Systems. Sinewave Amplitude Modulation. Sampling and Reconstruction. Finite Fourier Sum. Too Many Fourier Transforms? Time-windowing. Analysis of a Sum of Sinusoids. Discrete Fourier Transform. Spectrum Analysis of Finite-Length Signals. Spectrum Analysis of Periodic Signals. The Spectrogram. The Fast Fourier Transform (FFT). Notation for Complex Numbers. Euler's Formula. Algebraic Rules for Complex Numbers. Geometric Views of complex Operations. Powers and Roots. Appendix B: Programming in MATLAB. MATLAB Help. Matrix Operations and Variables. Plots and Graphics. Programming Constructs. MATLAB Scripts. Writing a MATLAB Function. Programming Tips. Introduction to MATLAB. Encoding and Decoding Touch-Tone Signals. Two Convolution GUIs.